The Nature Conservancy and its 550 scientists have created a site called Nature Works Everywhere "to help students learn the science behind how nature works for us - and how we can keep it running strong. This project gives teachers, students and families everything they need to start exploring and understanding nature around the globe alongside Nature Conservancy scientists." 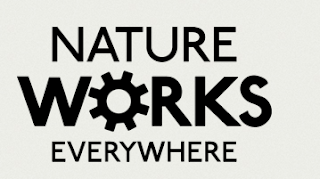 On March 16, 2016, the Nature Conservancy, as part of its Nature Works Everywhere project, will offer a free, real-time, virtual field trip aimed at students in grades 3-8. The field trip is entitled "How Nature Works in Coastal Peru: The Amazing Biodiversity of a Coastal Ecosystem". The field trip will be hosted by Matias Caillaux, a Nature Conservancy fisheries scientist. 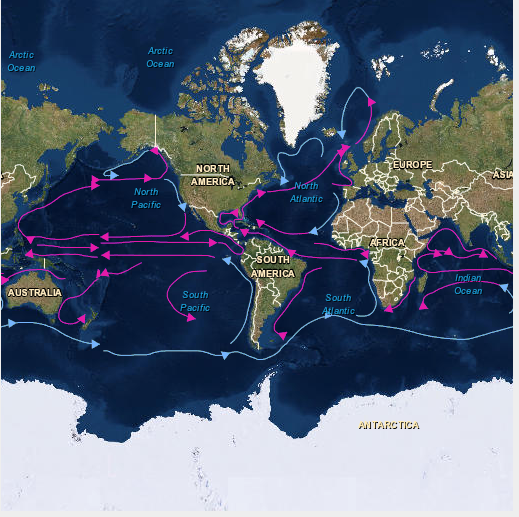 Students will learn about the Humboldt Current—a cold water current that pushes nutrients from the deepest ocean toward the surface, forming the basis of a unique and abundant ecosystem in which visitors find a variety of sea birds, flamingos, and even penguins! During the field trip, students will will learn that the productivity of this ecosystem is not only important to its animal inhabitants, but to the success of the region’s fishing industry as well. They will also discover what’s being done to protect this vulnerable ecosystem so that both people and animals can continue to thrive. To support the virtual field trip to Peru, the Nature Conservancy and the Nature Works Everywhere project provides interactive online materials to use to introduce the topic before attending the online field trip or viewing the archive, or after the event to follow-up on some of the important aspects of this ecosystem. 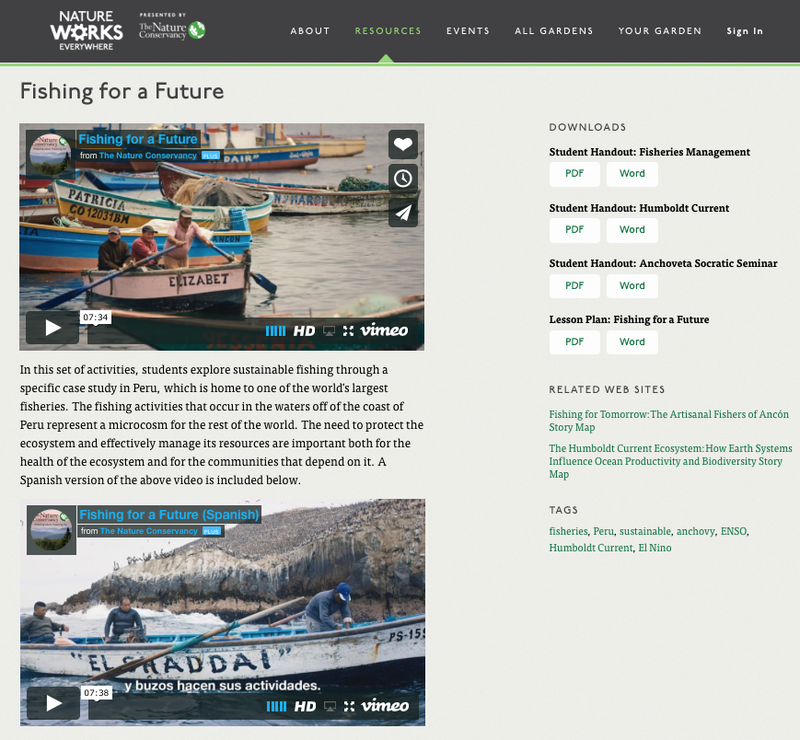 While working on the lessons and viewing the videos, students will explore sustainable fishing through a specific case study in Peru, which is home to one of the world’s largest fisheries. 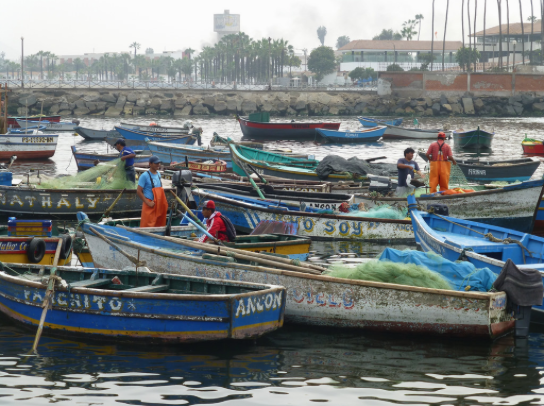 The fishing activities that occur in the waters off of the coast of Peru represent a microcosm of the rest of the world. The lessons include interactive story maps that allow students to explore the Humboldt Current, El Niño, and artisanal fishing; engage in a fisheries management activity using data; and participate in a Socratic Seminar that explores the challenges of open access fishing areas. Students will understand how the need to protect this ecosystem and effectively manage its resources is important both for its health and for the communities that depend on it. The content of the field trip and the lessons is also aligned with the Next Generation Science Standards. The field trip will begin at noon Eastern Time (US) on March 16, 2016, and last 45 minutes. The link to sign up is here. If the real-time March 16, 2016 time slot does not work for your class, you can still register to receive the YouTube viewing link after the event. In addition, a bit later, the Nature Conservancy will provide a link to the field trip video on Vimeo. I hope you are able to take your class on this interesting and educational field trip! This is a sponsored post on behalf of We Are Teachers and The Nature Conservancy. In part one of this two-part series, I explored the features of the Dell XPS 15 Touch laptop computer. I was given the laptop by Dell to review and figure out the best way to integrate it into my workflow as an educational technologist. 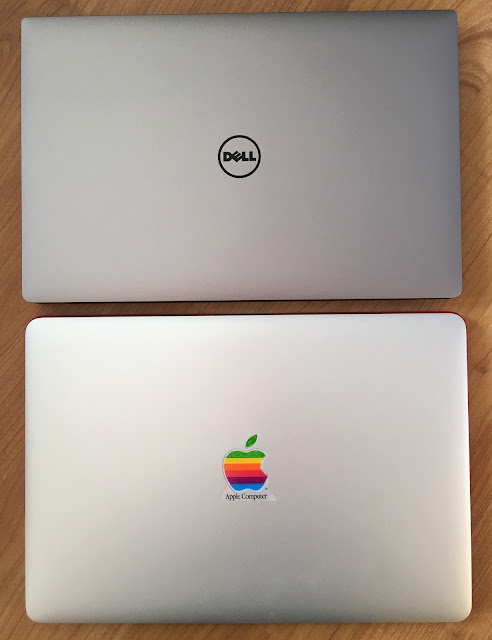 I have been a Mac user for the past seven years, and was excited to both set-up and use the powerful Dell XPS 15 Touch and also investigate the updated features in the new version of Windows. Many workforce users have two phones-- a work phone and personal phone. And others work on one computer operating system at work or school and on a different operating system at home. Can I learn the best way to use either my Dell XPS 15 Touch or my MacBook Pro Retina to get my work done? After spending time learning about the Dell XPS 15 Touch, I started getting it set-up with the tools and apps that were necessary to me. 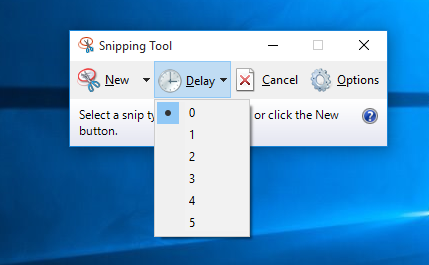 Of course, Windows 10 comes with a Snipping Tool that I will use regularly for screenshots. I installed my main collaboration tools — a Twitter client and Skype. I installed Adobe Premiere Elements and Photoshop Elements and various Adobe Creative Cloud applications. The rendering time of videos in both Adobe Premiere Elements and Adobe Premiere was super speedy on the Dell XPS 15 Touch. I have a subscription to Office 365 on my Mac, so installing it on the Dell XPS15 Touch was a given. I am also a huge OneNote user on all of my other devices, so I had t omake sure that was available. And, because Office 365 for Window includes Microsoft Publisher, I was re-united with this great program! I have yet to find something to rival it for the Mac. In addition to having access to Microsoft Publisher, I was also happy to again be able to use some of my favorite (legacy) Windows software apps. I quickly downloaded Microsoft Photo Story 3 and Microsoft Movie Maker. I was also able to try out Office Sway, a great creation tools for Windows and which is also available for iPad (but not available on the Mac). I was pleasantly surprised to see how easy it was to sync all my Microsoft Office documents using OneDrive. 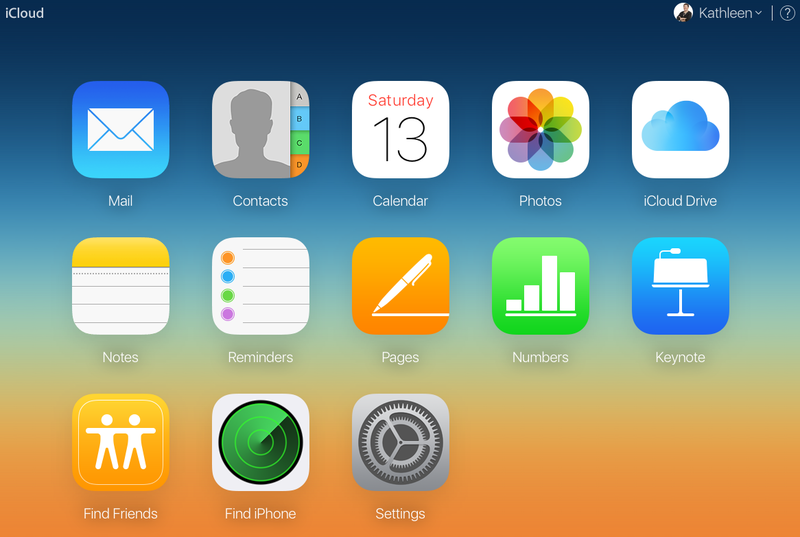 Everything stayed in sync across the Windows, Mac, and iOS platforms. The easiest solution to the sharing of files between the Dell XPS 15 Touch and the MacBook laptops is to use either the OneDrive or the Dropbox online file storage sites. I already have documents in both online services, and there are clients for both computer platforms and my mobile platform, so it will be a workable solution to use both. 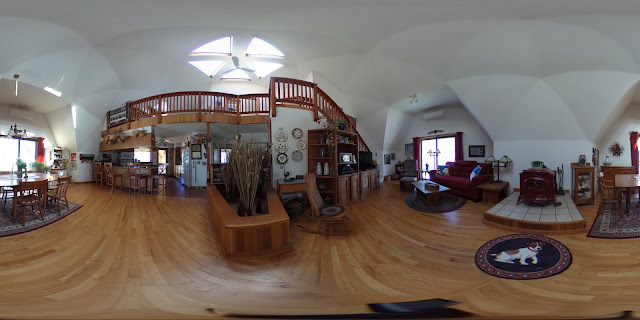 I am also a user of Google Drive through the Web browser, and I was easily able to get to my stored and shared files by using any of the Web browsers I had instgalled on the Dell XPS 15 Touch. I also installed the Google Drive app on the Dell XPS 15 Touch since I had just moved all my photos into Google Photos. To be able to project my iPad screen to the Dell XPS 15 Touch for presentation purposes, I installed Air Squirrels’ Reflector 2 app on the laptop. This Windows (or Mac) program turns your laptop into a wireless AirpPay device for your iOS devices. Since the laptop in a classroom is usually attached via a cable to a projector, Reflector 2 allows you or a student to project their iPad for the rest of the class by mirroring it onto the laptop and you are not tethered. Reflector 2 also allows you to record the projected iPad via the computer, so it is a great tool for creating an iPad tutorial or demo. I am not setting my iPad to backup to this Windows machine, but I did install iTunes to have my music library on the Dell XPS 15 Touch and to be able to move files from the desktop to the iPad if necessary. In addition, I can access Apple's iCloud through the browser to view and present my Pages, Numbers, and Keynote documents. I am a big Keynote user and my presentations are often huge, complex, and include lots of videos. When I try to save the presentation out of Keynote as a PowerPoint presentation, I am often disappointed with the look, the slide layouts, and the rendering of some of the videos. (Simple presentations easily move from Keynote to PowerPoint.) And, if I create the presentation in PowerPoint, it transitions a little better when opened in Keynote, but it is still not perfect. I will create and present in PowerPoint when using the Dell XPS 15 Touch, and, when using the Mac, I can use PowerPoint for Mac (instead of Keynote) showcase the presentation created on the Dell, and vice versa. I often create podcasts and audio files for videos, and the best local solution for success in a dual platform world is to use Audacity. 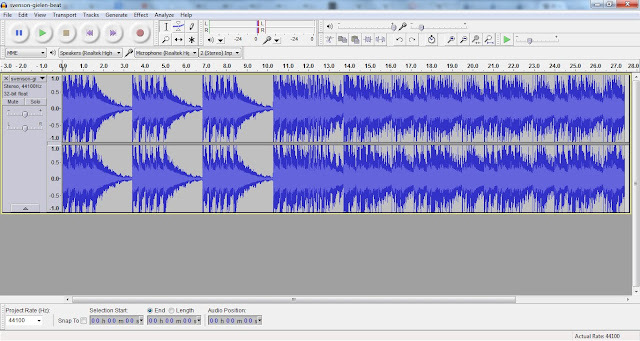 Audacity is an easy to use, open-source piece of software that works great on both the Dell XPS 15 Touch and the MacBook. 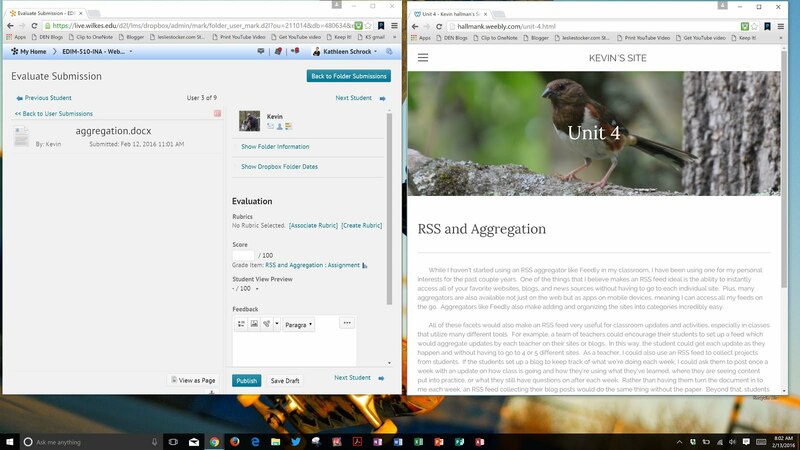 The extremely high resolution on the Dell XPS 15 Touch allows me to have two browser windows open. This is just perfect when I need to grade my graduate students' papers and view their online work at the same time! It is so nice to have that bright, 4K Ultra HD touch screen with the 3840 x 2160 resolution! Most of my other work is done via online tools, many of which can be found on this page of my site, Kathy Schrock's Guide to Everything. The Dell XPS 15 Touch worked perfectly with all of the tools and via all of the major browsers. Having the touchscreen available when working with the online tools really made the use of these tools easier and much faster! Can I learn the best way to use either my Dell XPS 15 Touch or my Macbook Pro Retina to get my work done? I really believe, since many of the major tools are available on both platforms, with the prevalence of online file storage sites, and more and more online tools, it no longer really matters whether I pick up my Dell XPS 15 Touch or my MacBook Pro Retina to complete a task. I can get my work done on either of them and can easily share documents between the two machines, too. However, with most specs being pretty equal between my two laptops (the Dell XPS 15 Touch and the MacBook Pro Retina), the Dell XPS 15 Touch still comes out ahead due to its great feature set. The Dell XPS 15 Touch's bright UltraSharp 4K Ultra HD touchscreen makes it easier and more efficient to use than the MacBook Pro, and, combined with the longer battery life and the single USB adapter for hooking up to multiple projectors and Ethernet, the Dell XPS 15 Touch is a winning combination of speed, build, and usability for a road warrior like me! 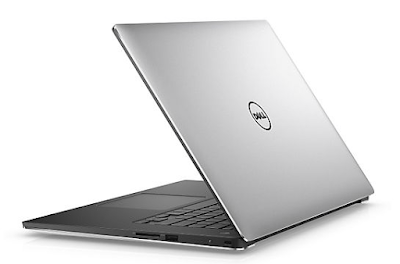 When a representative from Dell approached me and asked if I would like to receive the Dell XPS 15 Touch laptop and review it, I was excited! Being a Mac user, I was anxious to both work with this powerhouse of a laptop as well as see how Windows has progressed with Windows 10. 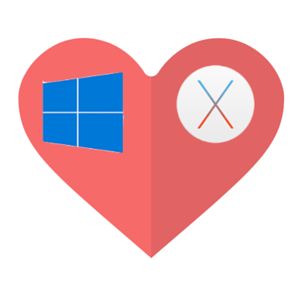 Could I learn to love working in a dual-platform relationship? I started off by learning all I could about this great laptop! A complete overview of the specifications follows with the options I received highlighted, but here are the things that impressed me the most. The 15" screen literally has no bezel! It stretches from side to side with a frame that is only 5.7mm wide! The screen of the Dell XPS 15 Touch is a 15.6" UltraSharp 4K touch display with a resolution of 3840x2160. It is very bright, crisp, and I can easily open multiple documents side by side when I am working. And the screen is made from Gorilla Glass, which means it is well-protected from scratches. I love having a touchscreen laptop! I have only used one once before, but after spending a lot of time with this Dell XPS 15 Touch, I realize what a time-saver it is! The hinge on the Dell XPS 15 Touch does not allow any wobble in the screen when I use it by touching what I need. I found myself using touch more and more as I spent time with the the laptop! This Dell XPS 15 Touch came with a 500GB SSD storage drive. It is extremely fast to open programs, start up, and shut down! In addition, the 16GB of RAM allow me to quickly render videos and speed up other RAM-intensive applications. The battery life of this model, with the 4K screen and the 84Whr battery, is estimated to be 11-12 hours! I have not put that to the test yet, but that would last me an entire airplane travel day in coach, where I don't often have a plug. This model of the Dell XPS 15 Touch, with the 84Whr battery, is ½ pound heavier than the version with the 56Whr battery, but the longer battery life is certainly worth the little extra weight! The keyboard is backlit, which is something that I have become quite accustomed to. The ports on the laptop include the standard HDMI, two USB 3.2 ports, and an SD card reader. However, the Dell XPS 15 Touch also includes the new powerful Thunderbolt 3 port (USB Type-C) which would allow me to hook up two additional 4K monitors to the laptop if I wanted to! There is a headset jack (which does both audio in and out) and a built-in 720p Webcam. Because of the thin bezel surrounding the screen, the Webcam is below the screen, near the hinge. Having the Webcam in this location will take some getting used to, since I usually am looking at the top of the screen when presenting a webinar or Skyping with colleagues. My Dell XPS 15 Touch came with a great accessory-- the Dell Adapter USB 3.0 to HDMI/VGA/Ethernet/USB 2.0 (DA200). This one little accessory replaces a multitude of dongles! It plugs into a USB port and contains an HDMI connection, a VGA connection, an Ethernet port, and another USB port. Having all of the connections I would need to present with included on this one little adapter is wonderful! My current Apple 15" laptop is a 2014 MacBook Pro Retina, with 16GB RAM and a 512GB SSD drive. 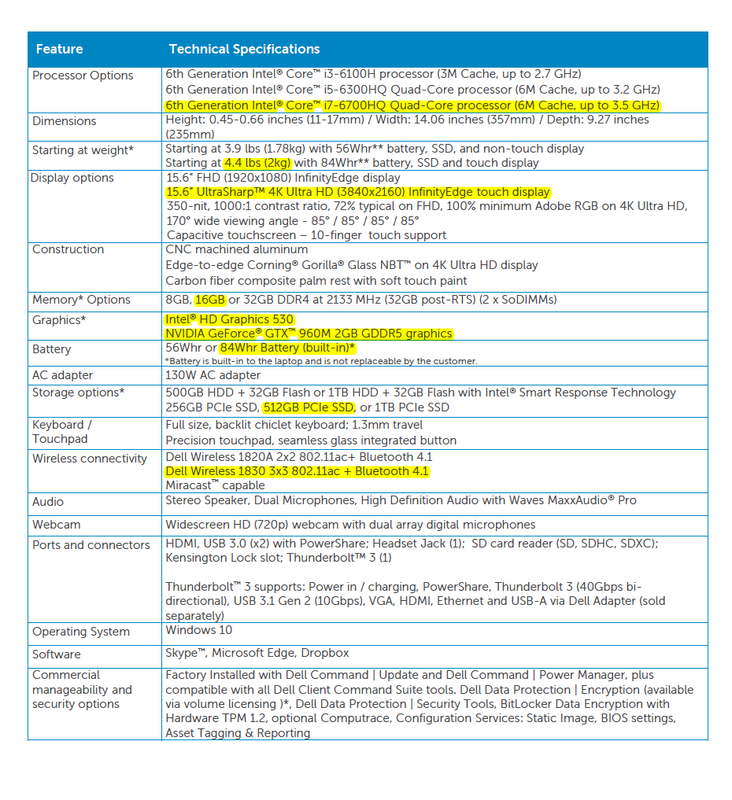 The specs and weight of the Mac are similar to the Dell XPS 15 Touch. But the Macbook Pro does not have the long battery life, the beautiful 4K touchscreen, and is a bit wider and thicker than the Dell XPS 15 Touch. I took some comparison shots after unboxing the Dell. Here you can see the Dell and Mac laptops open, closed, and on their sides. My first impression of the Dell XPS 15 Touch is that it is a powerful, fast, solidly-made laptop, with a killer battery life, the best screen I have ever seen, and, with the availability of the touchscreen, it is sure to speed up my workflow! With all else being pretty equal, could I learn to become comfortable using either platform to get my work done? Part two of this series will talk about learning to love both platforms!